What is the age cut-off date for Toddler Two – Kindergarten applicants? Toddler Two applicants must be 2 by December 31, 2019. Nursery applicants must be 3 by December 31, 2019. Pre-Kindergarten applicants must be 4 by December 31, 2019. Kindergarten applicants must be 5 by December 31, 2019. How do I arrange for a tour of the school? For Toddler Twos, Nursery, and Pre-Kindergarten, please call 212-725-7220 to schedule a tour of the Early Childhood Center. 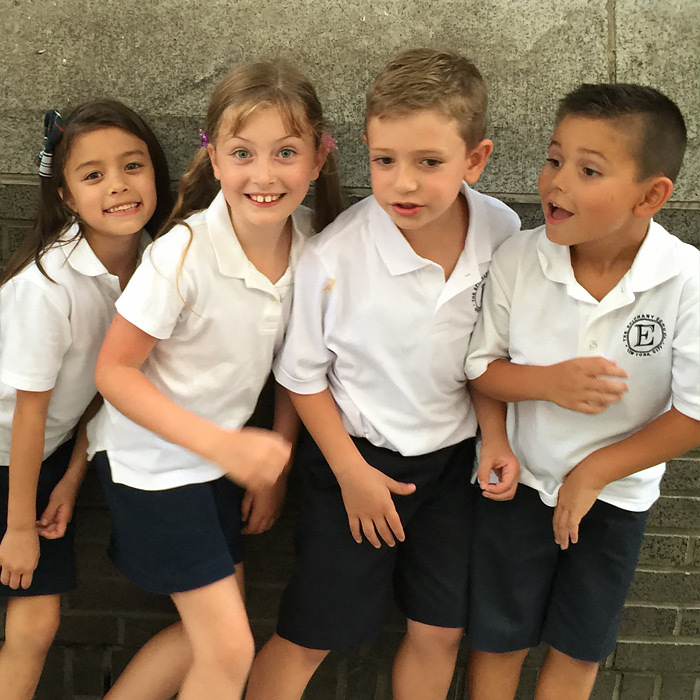 For Kindergarten – Grade 3, please call 212-473-4128 to schedule a tour of the Lower School. For Grades 4 – 7, please call 212-725-7220 to schedule a tour of the Upper School. Once my application has been submitted through Ravenna to the school, what is the process? All applications completed in Ravenna by January 15th will have access in Ravenna to schedule an appointment for a “playdate” (Toddler Twos – Kindergarten) or an admissions test (Grades 1-7). Upper and Lower School testing and Early Childhood playdates will take place in January and February. How will I get information about the status of my child’s application? How often do students attend religion class, school liturgies, and prayer services? As a Catholic school, our faith is central to all that we do. Students begin each day with prayer, attend religion class daily, and participate in school liturgies and prayer service each month. Although not all of our students are Catholic, all students attending Epiphany participate in the religious life of our school. How do students at The Epiphany School score on New York State tests? The Epiphany School’s scores on 2017 NYS Tests placed us in the top 15% in both ELA and Math across New York State. Does The Epiphany School have an after-school program? A custodial after-school program at the Lower School & Upper School Campuses provides care for students in Kindergarten and Grades 1- 8 for a $275.00 per child monthly fee ($30.00 for a single day). The program runs Monday-Friday from dismissal time until 5:30 PM. Lower School students are also offered a variety of extracurricular classes, including Science, Dance, Robotics, Cooking, Arts & Crafts, and Drama. Faculty conduct these classes for an additional fee which they determine at the time of enrollment. A catalog of offered classes and registration instructions will be provided prior to the start of each semester. A homework program at the Upper & Lower Schools for Grades 1-8 is available Monday – Thursday until 4:00 PM. At the Upper School special activity-based programs are also offered, including Newspaper, Art, Photography, Latin, and Book Clubs. Faculty conduct these classes for an additional fee which they determine at the time of enrollment. A catalog of offered classes and registration instructions will be provided prior to the start of each semester. The after-school program for Pre-K students runs daily from 3:00-5:30pm. Each afternoon begins with an organized activity such as Music & Dance, Sports & Movement, Drama & Improvisation, or Arts & Crafts. Students who remain until 5:30 will engage in group games, story time, and independent play. The monthly fees are: $375.00 for 5 days a week, $350.00 for 4 days a week, $325.00 for 3 days a week, and $300.00 for 2 days a week. For individual days the fee is $40.00 per day. Where do Epiphany students go to High School? The Epiphany School has a diverse student body with a variety of interests. Our students go to many types of high schools in and around New York City: Catholic, public, private, single-gender, co-ed, small, large. We aim to meet the needs and interests of individual students in the high school selection process. A list of our students’ high school choices from the classes of 2010-2017 can be found HERE . When will I be notified about the Admissions decision? Candidates who have completed the application process will be notified of the admission decision on March 1, 2019. What is the next step if my child is accepted? If your child is accepted, a $2,000.00 non-refundable deposit will be required to secure enrollment. Applicants placed on the Wait List for enrollment consideration will be notified if a place becomes available.